between the East of my youth and the West of my future. My experience abroad has been overwhelming in so many ways and one part of it was exceptionally intense, full of those rich life moments that only a journey across country can give, from the wild bushy East to the open endless West. The real American adventure for all those of you who love the beauties and the contradictions of the USA doesn't lie in a 5 day-tour coast to coast. Visiting the coasts and leaving out all the land in between is like reading the first and last page of a book. And then people make assumptions on the whole book! Real die hard America buffs embark on a journey -or even multiple ones- across country, hitting the road for miles and miles, through the big Midwestern States, living and breathing the geographical and cultural changes, being part of those very many special moments made of "heres and nows"across the prairie. The great American plains are much more than emptiness, bareness and vastness; they are recipients of extraordinary lives and stories that have always engulfed my imagination and I was finally there to live them all. 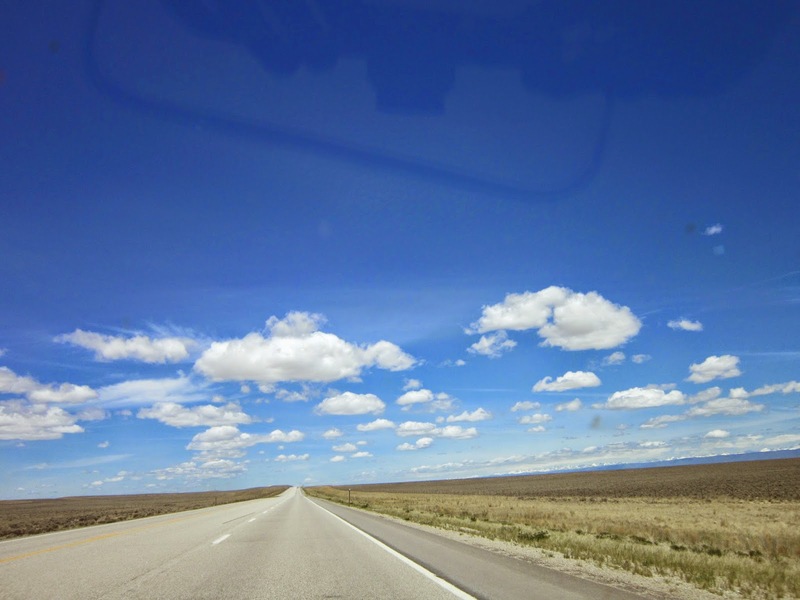 Driving across America had been a dream of mine for such a long time, and finally we were driving West. Our plan was easy and unsophisticated: pack the car, drive and stop wherever we felt like. Excitement was running high, we were ready to live an epic journey, where the road was the main element. We spent three weeks traveling: from Massachusetts, New York, through Pennsylvania, Ohio, to the plains of Indiana, Illinois, Iowa, to the prairies of Nebraska, up to the mountains in Wyoming, Idaho, and to the hills of Montana, South Dakota, Minnesota and then back. Once again, I felt like a pioneer, our wagon was a second hand car that was all set for the thousands of miles it was about to tackle. We had all the supplies we needed, the trunk was adequately full and refurbished. The road was awaiting us. Driving so many miles per day made me imagine those forerunners under the same sky and riding through the same places I was seeing and driving through. And yet my imaginary travel companions were passing through the unknown, following into no one's footsteps, as theirs were probably the first to mark the path for others to come. Ghost towns, dugouts and battlefields are reminders of past lives of miners, gold seekers, road-agents, cowboys, pioneers, farmers, soldiers and Native Americans who still haunt these places and contributed to shape America's spirit. Since then America has been traveled in width and length. There are plentiful travel accounts, among those one that stands out because it really speaks to my experience, is Kerouac's On The Road. At first I felt compelled to read it only because it is considered a masterpiece of American literature. I picked it up almost reluctantly and after fighting through the first chapter, I began to appreciate the beauty of its style. Some passages were pure poetry to me and had to write them down for fear of losing them. Some of his thoughts are also very insightful about the several journeys undertaken by the characters. For instance, the characters of the novel are "delighted" about "leaving confusion and nonsense behind and performing [their] one and noble function of the time, move". This frenzy and eagerness to be on the road pervades the whole novel. However, the excitement lasts till the wheels are spinning. The novel is infused with a deep sense of dissatisfaction; the search of something better that is always somewhere else and pushes the characters to be continuously on the move, which ultimately causes them to feel lonely and estranged. Their debauched life is an element that aggravates their sense of uneasiness in life, and moving seems the only way out. However, there is no final reward for reaching a goal, quite the opposite. When Kerouac's protagonist finally reaches the West coast, the place of his dreams, he feels like a stranger stating he"never felt sadder" in his life. He adds "LA is the loneliest and most brutal of American cities; New York gets god-awful cold in the winter but there's a feeling of wacky comradeship somewhere in some streets. LA is a jungle." Disappointment follows the anticipation of finally reaching California "the ragged promised land, the fantastic end of America." He goes to end of the American dream, only to leave again. Another element that intrigued me is his view of American wilderness. "I thought all the wilderness of America was in the West till the Ghost of the Susquehanna showed me different. No, there is a wilderness in the East" I couldn't agree more. I drove in the North East in all weather conditions and for long distances and quite often I felt lost in the middle of forests, bushes, swamps and dark rivers, which cannot compete with the great spaces but their thickness is untamed and wild all the same. There are many passages of his journey which thoroughly capture the meaningfulness and intensity of crossing the country; among those I couldn't miss Kerouac's prophetic vision, which has left me quite flabbergasted: "When daybreak came we were zooming through New Jersey with the great cloud of Metropolitan New York rising before us in the snowy distance. Dean had a sweater wrapped around his ears to keep warm. He said we were a band of Arabs coming in to blow up New York." Simply chilling. Had I read this book before my own journey, probably I would have never finished it. It made me feel nostalgic of driving down one of those endless highways or one of those telegraph roads. I relate to Kerouac's characters for their restlessness of staying put somewhere and their need to move, not so much to their excesses. That's where my journey overlaps and diverges from Kerouac's. The El Dorado is always there, behind the next hill, past the next curve, after the next town. We are travelers on an impossible mission; despite the fact we can't never reach this mythical place, we still like to fall under the spell of the road.